For many, the phrase genetically modified conjures up images of scientists creating frankenfoods with deleterious new properties or large agribusinesses trying to swindle farmers out of their hard earned pay. However, new research from scientists at Ghent University (UGent) and the International Potato Institute, suggests that nature has been genetically modifying plant species for far longer than molecular biologists. While performing metagenomic analysis of the sweet potato genome for viral diseases, the UGent researchers made an interesting discovery of transfer DNA (T-DNA) that was homologous to Agrobacterium species. Upon further analysis the investigators eliminated the possibility that the genes were present due to contamination of samples, since two different T-DNA regions were present in the cultivated sweet potato genome and that these foreign genes were expressed at detectable levels in different tissues of the plant. Additionally, the Agrobacterium genes were present in 291 sweet potato cultivars tested, as well as a few wild related species. Moreover, one of the T-DNAs was present in all cultivated sweet potato clones, but not in the crop’s closely related wild relatives, which would suggest that the T-DNA provided an advantageous trait that was selected for during domestication. The transfer of DNA between related and unrelated species, through horizontal gene transfer (HGT), has been observed as a natural phenomenon among bacteria for many years. While there are currently less examples of this mechanism occurring among higher eukaryotic organisms, new genetic techniques have uncovered that the frequency of HGT in these organisms is much greater than previously thought. Dr. Gheysen and her colleagues are hoping to broaden the discussion surrounding genetically modified crops and change the public perception that the science is damaging to the environment or the consumer. 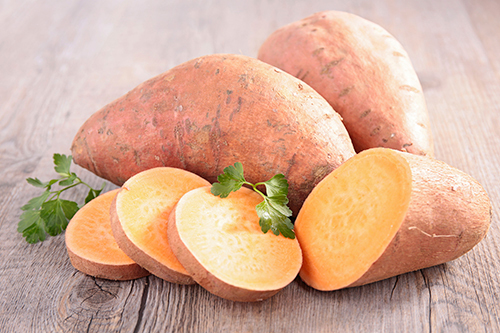 “The fixation of foreign T-DNA into the sweet potato genome occurred during the evolution and domestication of this crop, which is one of the world’s most consumed foods. This finding could influence the public’s current perception that transgenic crops are unnatural,” concluded the researchers.